Amybeads: Call for Design Team Members! If I could be so LUCKY! Check this out....Suburban Girl Studio is looking for design team members! 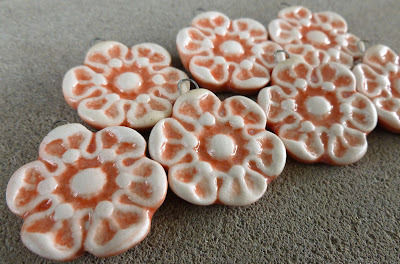 How delicious are these ceramic flowers, Bloom & Grow?! And did I mention that I LOOOOOOOOOOOOVE the color orange?! You and me both! I have put my name in the hat too! Fingers crossed we both get picked! SOOOOO DELICIOUS!!!!! I have a recent beautiful necklace made by you with several strands of gorgeous colors, MANY of which would look so yummy with these gems!!!!!! !